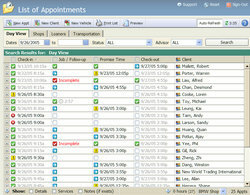 ShopTrak has the easiest, most comprehensive service scheduler available anywhere. On 1- screen, we show what takes over 80 screens in Reynolds! PLUS, we incorporate loaners, shuttles, waiters, valets, car-washes... anything needing a schedule. ShopTrak can replace all non-integrated systems: log books, spreadsheets, calendars, whiteboards, stacks of print-outs, etc. We do it all – simply. We put information at your fingertips, eliminating the guesswork and errors that lead to problems. 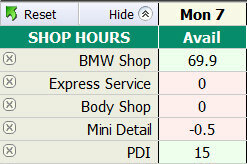 ShopTrak's Scheduler is an indispensable tool. Request a Demo and let us show you how ShopTrak can help your operation. Copyright © 2006–2012 Upfile Inc. All rights reserved.